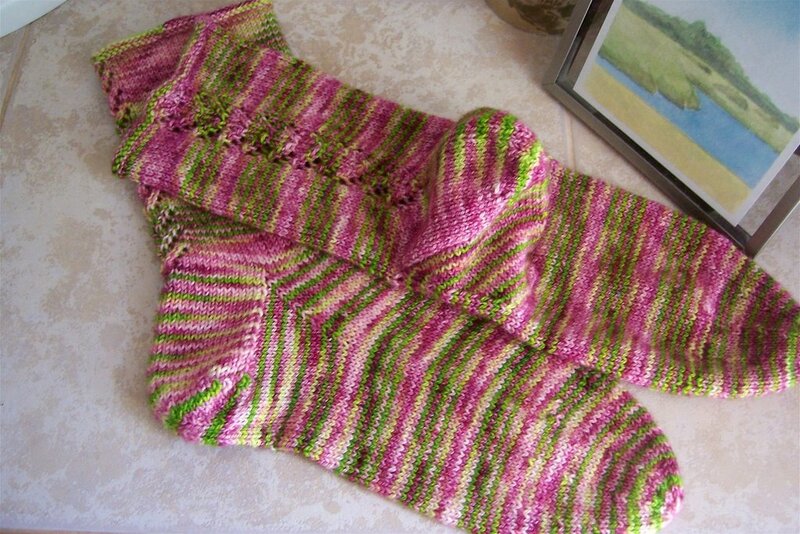 Here are my Calla Lily socks, washed and ready to wear. They are incredibly soft and comfortable (did I say that before?). Too bad it’s so hot today! It’s close to 90 here, even so close to the ocean. It’s a good beach day for all the Summer People, and a good day for me to stay home near the air conditioner. I sewed something besides the hems on a pair of pants! This is the sock bag for my pal in the Knit Sock Kit Swap. I used the Leetle Bag pattern by Beth at Yarn Envy. I can’t believe I actually did it, and that it looks perfect, and that I smiled all the way through the experience. Well, almost. There was a moment when I realized that I’d stitched the seams down in a wacky (and wrong) way. Out came my trusty seam ripper, and I was back on track in a minute or two. And it’s even in Project Spectrum June colors! I’d been putting it off, but I had to make the bag eventually. I have an old Singer zig-zag machine that runs well and takes care of my basic sewing needs, but I’ve never really used it for, you know, sewing. My mother sewed all our clothes while we were growing up, and many of mine into adulthood, and all her own, and then more for the grandchildren as they began to arrive. My sister S and I, being just thirteen months apart, always had coordinating outfits — Easter dresses and coats of reversible linen, or first-day-of-school dresses with sailor collars. She used to have a theme for the grandkids at Christmas, too — one year it was nighties (they must’ve been all girls at the time), and another year she made fish-shaped pillows (those were memorable), and weren’t there fabric hobby-horses one year? My mom loved to sew, she did. I didn’t inherit the family affinity for the sewing machine (I still cringe at the thought of my eighth-grade Home Ec project, a lime green with polka-dots dress), but S did. She’s a quilter. She has a really cool sewing machine that probably makes coffee if you program it right. Anyway, I’m happy with my little aqua-colored Singer that putt-putts along, zig-zagging when I need it to. And today I made a really neat sock bag with a lining and a drawstring and everything! Next I’ll decide what sort of pattern I’m going to include in my kit, and I’ll gather a few extras and goodies. I should have it ready to go in a week or so. Now that I’ve finished the bag, I think the rest will be a breeze! I’m knitting away on a few things that have been neglected. I have just a few inches left on a hemp mesh bag, one and a third Trekking socks to go, and an experimental Socks That Rock scarf (GASP! What? Not socks?) in the Fairgrounds medium-weight that was meant to be socks. They didn’t thrill me so I’m trying something else. I hope everyone reading this is staying cool, has something sweet on the needles, and has plenty to smile about today, like me! Calla Lily socks look lovely. I just started mine this week ( had to free up so needles…) and that little bag is so cute.hard to stay cool today, but its definitely a good day to sort things out in the cool AC! I like your Calla Lily socks and your sock bag. Much applause and appreciation for the Calla lily socks! You’re amazing, cranking out so much beautiful stuff while managing the books store during summer. I salute you!More weird coincidences: my sister and I are thirteen months apart! “Irish twins” is what people always called us. My parents called us “the girls.”Would love to meet your sister. your socks look great — mine got one row done — it is just too hot. Even with the fan in the window, the fan on the floor and the ceiling fan — I even tried knitting in the bedroom where there is air conditioning but couldn’t get comfortable And tomorrow is supposed to be worse??!!! Great Socks! Yikes… I think it is hot in every corner of the country this weekend… to hot here to knit, even cotton somethings. My mum made all my sister and my clothes for a long long time… it is such a lovely thing to wear something made for you, tho I think we did not appreciate it enough when we were little. metometometo – I adore those socks. And your story about your mother’s sewing skills reminds me of my own mother – who sewed for me as a young girl till I took lessons when I was 12. After that she continued to sew for me if I asked, but what she made would always be a little off – the waistband too tight or a shoulder crooked. When I would complain, she’d look at me with wide eyed innocence and say “Well, you know how to sew. Make it yourself.” Later I asked her if she’d done that on purpose (which I am sure she did) but she just gave ma a blank stare and asked whatever was I talking about?mama was so cool. Those socks are the prettiest I have ever seen! I love them, truly! Hope they feel as great as they look on your sweet feet! Your Calla Lily socks are lovely! 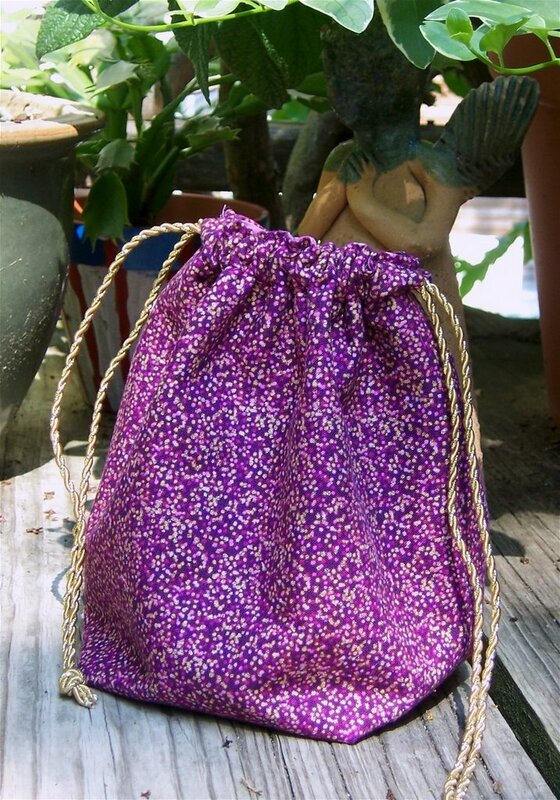 Her yarn is so nice…The bag looks great! !